Ticket prices: Hesselby – Roma – Hesselby (round-trip) Adults SEK 130, children 3-15 years 65 SEK. Tickets for shorter trips and single way tickets is sold on request. Important information for our visitors: Our steam engine is 99 years old. Since it is a delicate piece of machinery, breakdowns may occur. At times it may not be possible to repair the engine until the next day. On these occasions service is provided by a historical diesel locomotive. We also do this in very dry weather conditions. Our steam engine “Dalhem” at the Roma station, with coaches SlRJ F 7, GJ CD 43 and GJ Co 8. During the summer of 2019 it will be possible to rent trolleys. But only on days when there is no train service. From Visby, follow county road 147 (which terminates at Slite in the east) for about one kilometre. After one kilometre – and you are now east of the “Visbyleden” route (148) – you turn right. The blue road sign will say ”Dalhem 17″. You will pass through the hamlet ”Endre”, reaching Dalhem shortly afterwards. Hesselby station is situated in the Dalhem parish, 700 meters south of the church which is one of the island’s grandest places of worship. Other sights in Dalhem is the country store museum, ”Dunbodi”. If you prefer to travel by bus to Dalhem, take bus service 41 from Visby bus station. It operates daily between Visby and Katthammarsvik. Roma station is situated in the middle of Roma village. From Visby follow the county road 143 15 kilometers to Roma. Look for a brown roadsign at the left side of the road, with the text “Museijärnväg”. If you prefer to travel by bus to Roma, take bus service 11 from Visby bus station. It operates daily between Visby and Hemse/Burgsvik. The railway station of Burgsvik featuring a railbus prior to departure towards Visby. 1947-48. 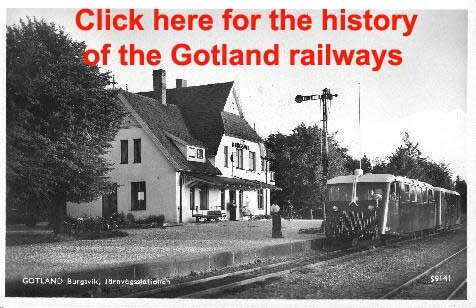 Post card from the archive of the Gotland Heritage Railway. The Railway Cafe, which has both an open-air and an indoor cafeteria, is famous all over Gotland for its tasty and home-made sandwiches and cakes. 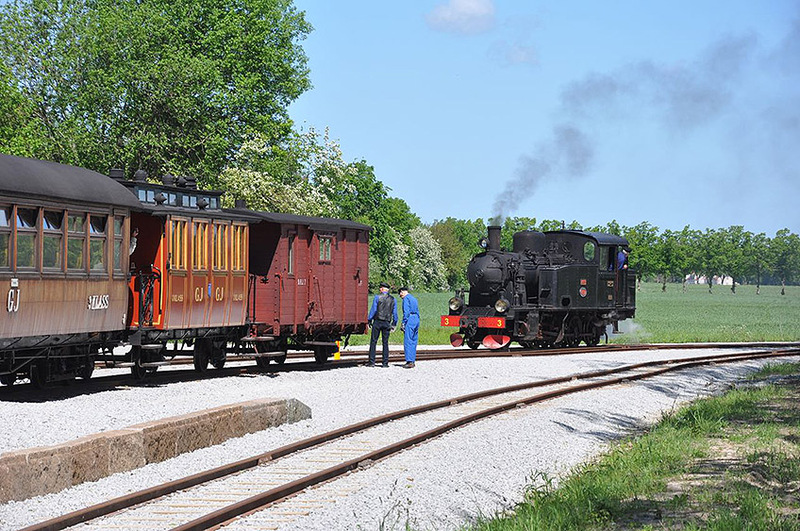 The Gotland Train Association leases the café to Eva and Ove, who runs the café. The Railway Cafe is open on weekends during the spring and autumn. In the summer it is open Sundays from 2nd of June to 25th of Augusti and Tuesdays to Sundays from the 24th June of July to the 17th of August between 11.00-17.00. Telephone to the Cafe: +4673-6264918. We suggest that group visits are booked in advance. During the entire season, groups are of course most welcome on train service days. On other days, we are happy to arrange for special trains. Such arrangements are subject to a surcharge. Please book in advance on telephone +46498-380 43 or +46705830519. The buses on Gotland Timetables of town and county buses. Line 41 goes to Dalhem (Hesselby), Line 11 goes to Roma.